Stripgenerator.com - ...and the old folks wished them well. ...and the old folks wished them well. Oui, I did do that thing. No, I don't speak French. There was talk of bad word play and this just sort of popped in there. I don’t know. 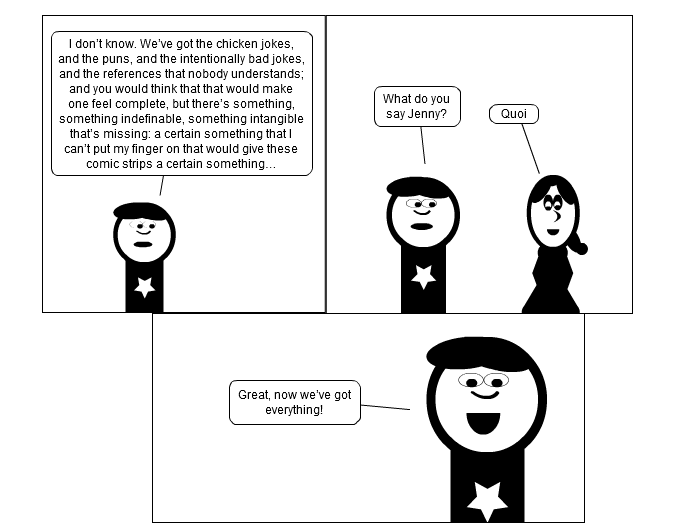 We’ve got the chicken jokes, and the puns, and the intentionally bad jokes, and the references that nobody understands; and you would think that that would make one feel complete, but there’s something, something indefinable, something intangible that’s missing: a certain something that I can’t put my finger on that would give these comic strips a certain something… What do you say Jenny? Quoi Great, now we’ve got everything! Well, bad word play is better than no word play at all, or is it?! can you pop it back in lol :D j/k dieing is easy comedy is hard!